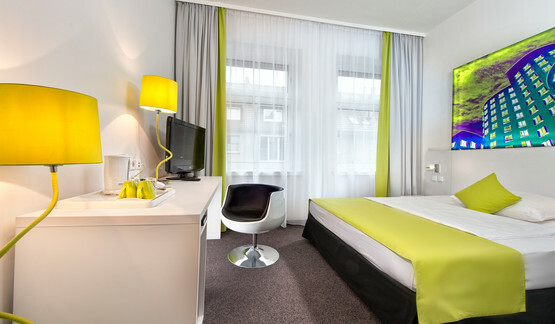 The hotel rooms at our Wyndham Garden Duesseldorf City Centre Koenigsallee Hotel are comfortable, spacious and well-equipped. You can either take a shower and relax, log on to the Internet via WiFi or enjoy a cold drink from the mini bar or at the cosy lobby bar. We offer anti-allerical hotel room with special floor. Please contact us before your arrival! The hotel rooms at our Wyndham Garden Hotel Duesseldorf City Centre Koenigsallee are comfortable, spacious and well-equipped. You can either take a shower and relax, log on to the Internet via Wi-Fi or enjoy a cold drink from the mini bar or at the cozy lobby bar. We offer anti-allergic hotel room with special floor. Please contact us before your arrival! All hotel rooms have individually adjustable temperature controls, Wi-Fi access, a mini-bar filled with 4 soft-drinks that are included in the room price, coffee and tea making capability, satellite, telephone (with outside lines), room safe (free of charge), windows which can be opened, a bathroom with bathtub or shower, hairdryer, cosmetic mirror and complimentary cosmetic articles. 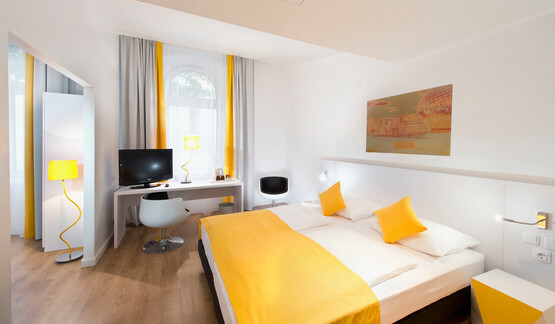 The Superior rooms of the Wyndham Garden Duesseldorf City Centre Koenigsallee Hotel are more spacious, compared to standard rooms. They also include individually adjustable temperature controls, Wi-Fi internet access, a mini-bar filled with four soft-drinks that are included in the room price, coffee and tea making capability, satellite, telephone (with outside line), room safe (free of charge), windows which can be opened, a bathroom with bathtub or shower, hairdryer, cosmetic mirror and complimentary cosmetic articles. 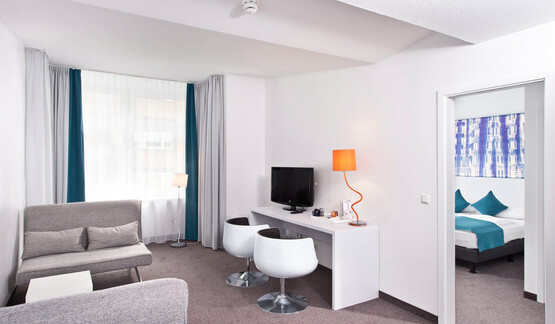 The Studios of our hotel in Düsseldorf feature a separate living area and bedroom, as well as bathrobes and slippers. Here you will find individually adjustable temperature controls, Wi-Fi internet access, a mini-bar filled with four soft-drinks that are included in the room price, coffee and tea making capability, satellite, telephone (with outside line), room safe (free of charge), windows which can be opened, a bathroom with bathtub or shower, hairdryer, cosmetic mirror and complimentary cosmetic articles.